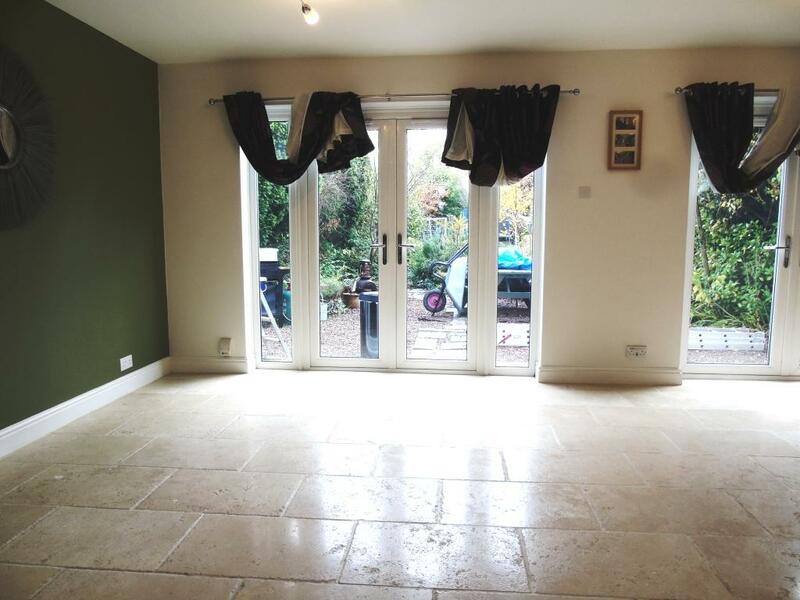 This beautiful Limestone tiled floor was installed in the lounge of a house in the popular London commuter town of Esher. 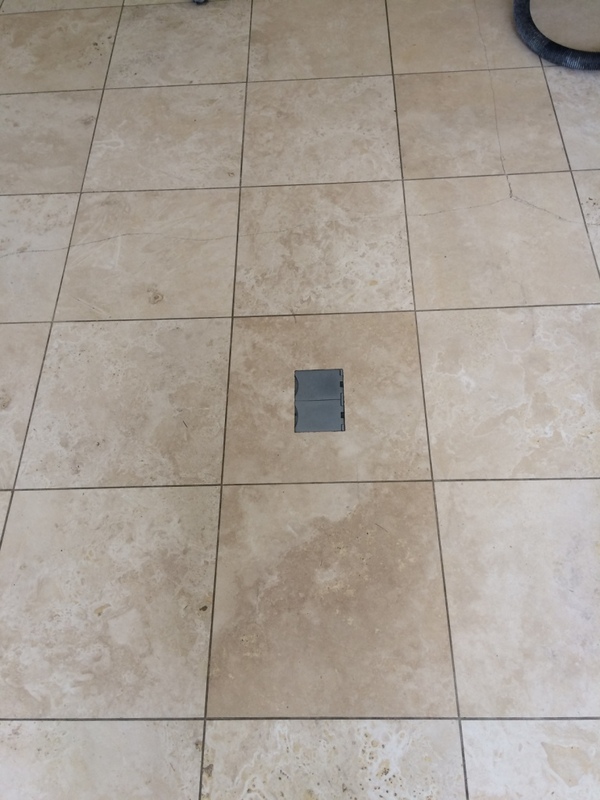 The floor was looking dull after years without a polish and the grout was dirty, there was also a crack running along a number of tiles however without matching replacements it was decided not to address that problem at this time. 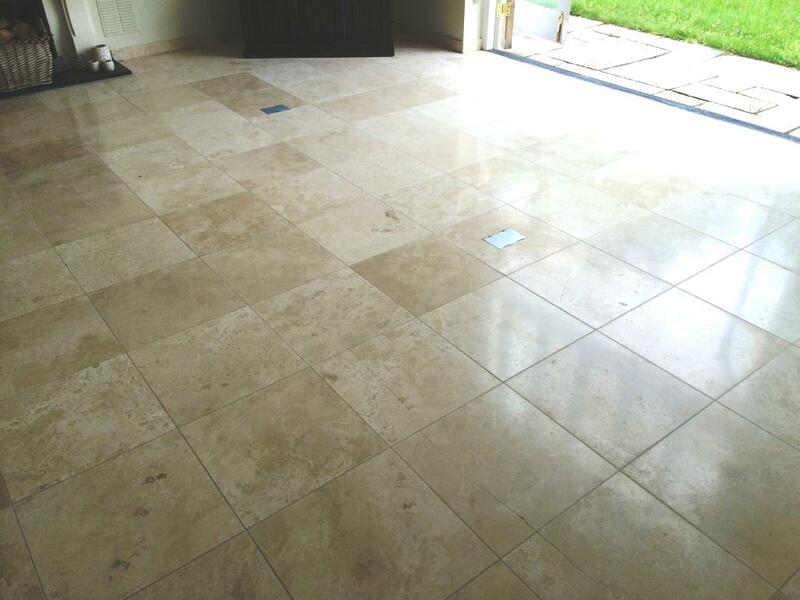 Limestone is a very tough stone so to clean the tile and rebuild the polish it would need to be burnished using different grades of Diamond encrusted pads and then sealed to protect it from ingrained dirt and stains. It’s worth noting that polished stone tile does need to be regularly maintained if you want to keep up its appearance and Tile Doctor does offer this as a service. Before working on the tiles I decided to treat the grout to a good old fashioned scrub with a strong solution of Tile Doctor Pro-Clean and stiff grout brush. This soon got the grout clean and the soiled cleaning solution was then rinsed away with water and then extracted with a wet vacuum. Next step was to start the burnishing process using a coarse pad which was attached to a rotary buffer and then, using a litre of water per square metre as lubrication, I cleaned and stripped away any remaining sealer. Once I’d removed any excess residue with the wet-vacuum, I changed to the a medium grit pad, repeated the cleaning process, and again extracted the soiled residue. Finally, I completed the process once more with the fine grit pad. Once this was completed I buffed the floor with a soft white pad to clean up any dried residue, leaving it ready to be sealed. Two days later, once the floor was completely dry, I returned to the property to seal and polish the floor. To begin, I restored the shine to the tiles by applying the last of the four burnishing pads – the very fine grit pad. 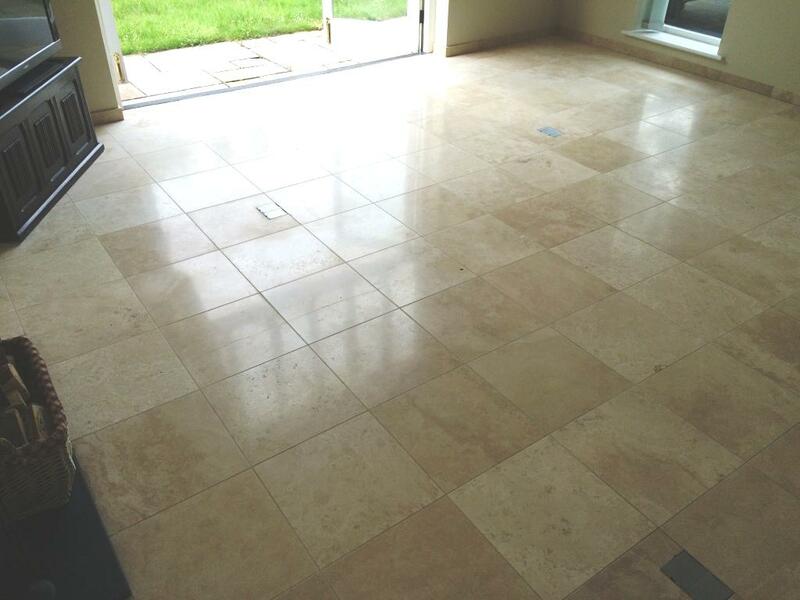 To seal the Limestone I applied Tile Doctor Ultra Seal which is an impregnating sealer that soaks into the pores of the Limestone to provide durable protection against ingrained dirt without changing the natural look of the tile. Limestone is known on the international market for its premium toughness, durability and aesthetic characteristics. This can make it difficult to maintain however, especially if the stone has been polished and lustre on the stone has started to wear down which is inevitable with use. The traditional method of getting a the shine back on polished stone is called honing which is expensive however at Tile Doctor we have worked out a much more affordable process called burnishing which utilises different grades of diamond encrusted pads to clean and then bring up the polish. 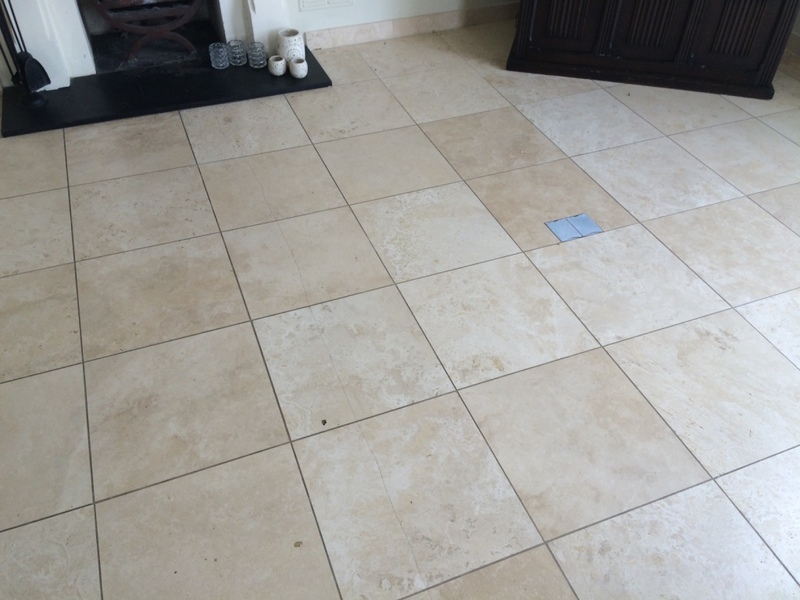 I recently undertook the restoration of a large area of Limestone tiles in the kitchen and lounge of a property in Yate, Gloucestershire. 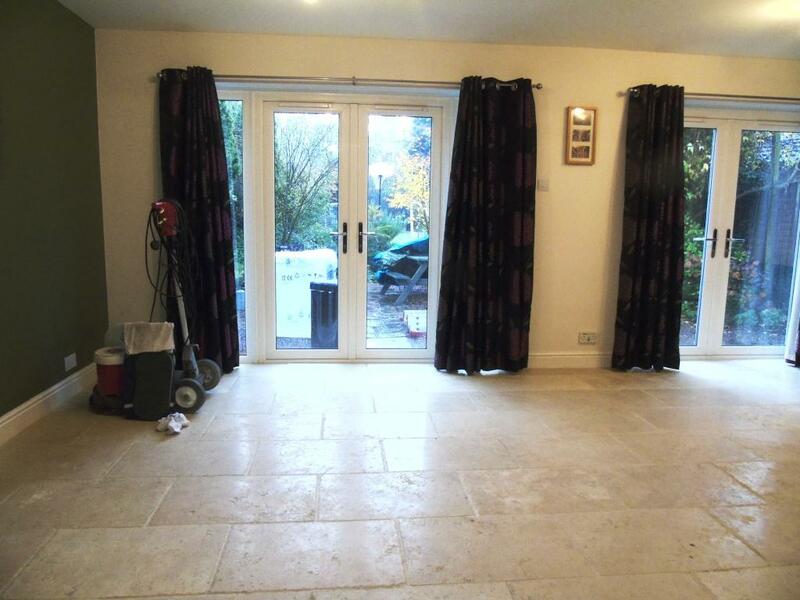 The floor as a while had become dull and dirty – and was long overdue some professional attention. Before starting I removed the kick boards from the underneath the kitchen units so they wouldn’t get affected by the cleaning process. Once prepped I started the burnishing process which is a chemical free process that uses a small amount of water for lubrication and a quick rinse between the use of each pad. I started with the first of the four burnishing pads which is a coarse 400 grit pad that designed to grind away the dirt and old sealer on the surface of the floor. After applying the first pad, I moved my way through the medium 800 and fine 1500 grit pads to gradually build up the shine. As the floor became cleaner it became apparent the grout lines were not in particularly good condition as well so I opted to clean these using a stiff grout brush and Tile Doctor Remove and Go which is specially formulated to remove old sealers whilst tackling dirt and stains. After completing the clean and giving the floor a final rinse I extracted as much moisture from the floor as possible using a wet vacuum and left the tiles to dry off overnight. Returning to the property next day, I tested to check tiles were dry and then proceeded to buff the tiles once over using the last of the four pads which is a 3,000 grit burnishing pad that finished off the polishing process. Finally, I applied two coats of Tile Doctor Ultra Seal, which is an impregnating dealer designed to provide maximum stain production with a natural look finish. I buffed further in between each coat to ensure the best possible polish was achieved. This was a tricky floor to photograph due to the sunlight streaming through the windows on both days but hopefully you can appreciate the difference as much as the customer can.